Valencia - Interoute Italia - subsidiary of the owner operator of one of Europe's largest networks and a global cloud services platform - has presented the results of the LIGHTNESS project to international experts convened for the annual European Conference on Optical Communications in Valencia (ECOC). LIGHTNESS is an EU research project, coordinated by Interoute Italia, which was started in 2012 and is supported by businesses and several international research centres. The LIGHTNESS project aims to develop solutions for data centre infrastructures in anticipation of the rise of new 5G technologies and standards and a subsequent mobile traffic boom. The increasing use of mobile devices as well as the advent of the Internet of Things (IoT) is set to substantially increase mobile data by 2020. Future networks will need to support a plethora of diverse mobile devices with unprecedented requirements for transmission speed, acceptable delay, number of supported devices, deep control mechanisms for traffic and highly dynamic management of the virtual and physical resources available to operators. Data centres are heavily impacted by these new traffic patterns and will need to advance accordingly towards 5G. The LIGHTNESS project takes advantage of benefits such as improved power consumption, speed and Quality of Service (QoS), which optical transmission can bring within and between data centres, creating a more dynamic and manageable infrastructure for a 5G future. The project results demonstrate a new fully optical software defined data centre, where Optical Packet Switching (OPS) and Optical Circuit Switching (OCS) technologies are integrated with a Software Defined Network (SDN) controller, for a scalable and programmable data centre architecture. New traffic control techniques in the optical data centre designed through LIGHTNESS could allow operators to manage all data centre resources in a more dynamic way, leading to reduced costs and end-to-end service improvements for end-users. The project focuses on the integration of OCS and OPS technologies as a mechanism to match different traffic patterns. The first tests of the prototype presented in Valencia demonstrate data transmission rates from 40 to 100 Gigabits per second over a chain comprising of a programmable hybrid (OCS/OPS) Network Interface Card, an OPS switch, an Architecture on Demand OCS switch, a hybrid (OCS/OPS) ToR switch and a fully optical ToR switch. Control of this optical data plane has been enforced through the SDN controller based on an extended version of OpenDaylight, fully integrated with the optical devices mentioned. "LIGHTNESS prototypes for both hardware and software are ready to be implemented," says Matteo Biancani, Sales Director at Interoute Italy and Project Coordinator of LIGHTNESS. "What we are presenting these days is a project that is not only innovative and concrete, but also immediately relevant to address the evolving telecommunications market and to better manage the advent of the 5G standard." The LIGHTNESS project, now close to completion, has received EUR 2.44 million of funding from the European Commission under the 7th Framework Programme for Research and Development, and involved seven partners from Italy, the Netherlands, Spain and the United Kingdom. Partner organizations of the LIGHTNESS project are: Interoute (IT), Technische Universiteit Eindhoven (NL), Nextworks (IT), University of Bristol (UK), Barcelona Supercomputing Centre (ES) and Universitat Politecnica de Catalunya (ES). 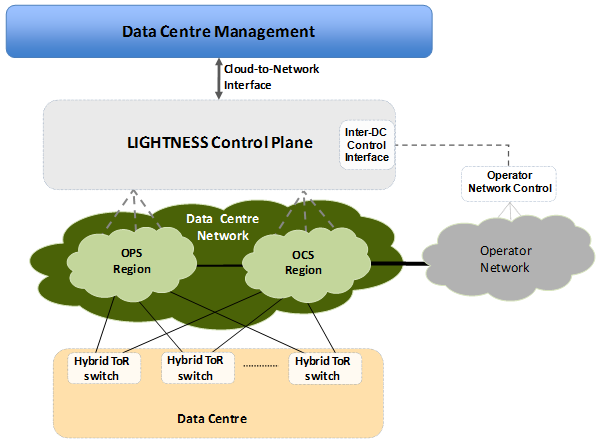 0 comments on "Interoute presents the LIGHTNESS project: all-optical software defined data centres on the road to 5G"